Senate Majority Leader Harry Reid, a Democrat and member of The Church of Jesus Christ of Latter-day Saints, said yesterday that he thinks Mitt Romney (a Republican and member of the same church) is “not the face of Mormonism,” and that Romney has “sullied” the faith. The [church’s] welfare plan is an integral part of the plan of salvation. Some have become confused about what “welfare” really means. Some approaches to welfare in the world foster idleness, give subsidies with no labor required, create a burden of debt, and promote greediness—an appetite for things of this world rather than the riches of eternity. Too often rich and poor alike shut their hearts to the divine attributes of love and compassion. The rich languish in their abundance and justify turning the poor away as “welfare cases.” The poor are likewise entrapped, becoming dependent on others in a system destined to trample initiative, undermine family responsibility, foster divisiveness, and erect barriers to equity, opportunity, and fellowship. The Lord rejects such welfare programs. Strong words such as these condemn the claim made by Senator Reid and actually strengthen the position, imperfectly enunciated by Mitt Romney, that reliance upon government programs for one’s welfare is a bad thing. Romney’s position does not “sully” the Mormon faith any more than a high-ranking leader (and Jesus Christ himself) sully the faith by saying similar things. If Reid wasn’t so concerned with partisan bickering and actually wanted to get to the heart of issues that might legitimately “sully” one’s publicly expressed faith, he might have pointed to Romney’s support for preventive war, the NDAA, the war on drugs, and a whole host of policies which violate the Constitution to which he would swear an oath. Of course, Reid can’t point to those things, because then it would mean that he has for years been sullying his faith. Thanks for a good story. To the point and a great explanation to the people that just don’t get it. Those that are always finding their own explanations to fit their own agenda. Connor, not that I believe it would ever actually reach his eyes, but have you emailed this to Senator Reid? The church has always taught self-reliance and not being in debt to anything or anyone (except Heavenly Father and Jesus Christ). The idea that government can provide better for the people than they can for themselves goes against this principle. The parable of teaching a man to fish as opposed to giving him a fish comes to mind. Senator Reid is in fact posturing and putting the Church in the middle of politics this way certainly isn’t helping matters. Interacting with a mission president who had an extremely different personality and way of dealing with people to my own, I had to learn the lesson on my mission that there is room for all types of people in the Church. Yes, there are good Mormons like Romney, and good Mormons like Reid, and good Mormons with all manner of careers, political opinions, and personalities. While a Romney administration would no doubt introduce policy (particularly foreign policy) that I personally find incompatible with my LDS faith and beliefs regarding universal human dignity, I would hope we as a culture can avoid making insinuations about a person’s faith or legitimacy as a member of the LDS faith. I love Greg Prince, but it should be known he made his comments because he has a disabled son supported on government programs. The government declares war on something and then fails miserably–drugs, welfare, and even war itself. However, church welfare as administered is great but it is pathetically worse than our US government in supplying far less of a return to those in need than what it could provide because only a very small fraction of what is available for human relief is used for real pressing needs both within our ranks and for humanitarian purposes. It used to not be that way, but over time we have a corporate model rather than a church model when it comes to charity. What this country needs is a good revolution by the poor souls that voted for leadership and integrity (Note I didn’t include honesty because we all know politicians aren’t honest) If it’s good enough for the Arabs, it should be good enough for Americans. I say we need a good march on Washington with a tar barrel and baskets of chicken feathers. If our representatives refuse to govern for the common good, then revolt I say and physically remove them from office. My vote goes to the only Melchizedek Priesthood holder in the race, political considerations pale into insignificance. That’s an extremely low standard, David. Romney held the priesthood while Governor of Massachusetts, which says nothing of the policies he implemented as Governor. There are plenty of anti-liberty priesthood holders who are not good, honest, and wise—the Lord’s electoral standard set forth in scripture. Thank you for that quote by Elder Hales! I’m always looking for quotes by current church leadership, as Mormons have a habit of dismissing any E.T. Benson and D.O. McKay as irrelevant in today’s world. Aili, there is an abundance of statements from church leaders that support Connor’s understanding of the Elder Hales quote, and a dearth of any to the contrary. Work brings happiness, self-esteem, and prosperity. It is the means of all accomplishment; it is the opposite of idleness. We are commanded to work. (See Gen. 3:19.) Attempts to obtain our temporal, social, emotional, or spiritual well-being by means of a dole violate the divine mandate that we should work for what we receive. We cannot be too often reminded that Church welfare assistance is spiritual at heart and that these spiritual roots would wither if we ever permitted anything like the philosophy of the dole to enter into our Welfare Services ministrations. Everyone assisted can do something. Let us follow the order of the Church in this regard and insure that all who receive give of themselves in return. May we be on guard against accepting worldly substitutes for the plan to care for his poor in this, the Lord’s own way. The Lord’s way builds individual self-esteem and develops and heals the dignity of the individual, whereas the world’s way depresses the individual’s view of himself and causes deep resentment. The Lord’s way causes the individual to hasten his efforts to become economically independent again, even though he may have temporary need, because of special conditions, for help and assistance. The world’s way deepens the individual’s dependency on welfare programs and tends to make him demand more rather than encouraging him to return to economic independence. The Lord’s way helps our members get a testimony for themselves about the gospel of work. For work is important to human happiness as well as productivity. The world’s way, however, places greater and greater emphasis on leisure and upon the avoidance of work. Thanks for the additional quote. It doesn’t, unfortunately, speak to what I was having an issue with. You can’t quote a statement that contains a number of qualifiers, then claim that the statement does not. Quite simply, it’s a fallacy. The quote I gave lists a good amount of qualifiers for a welfare system to be considered “the Lord’s way”, and therefore, building rather than destroying of an individual. I’ve never seen a government run welfare system that did not fail to qualify as “the Lord’s way” according to these qualifiers. We weren’t speaking of your quote, we were speaking of Connor’s quote and his interpretation of that quote. But, concerning your quote, yes, there are government programs, even in the US, that qualify. Programs of the WPA from the Great Depression are a good example. They provided sewing jobs for women, gave projects to artists, etc. This was a welfare program specifically intended to get people to work. It was also temporary, so specifically not designed for permanent dependence. A contemporary example is TANF, wherein aid is given, but only for a temporary time (so no dependence), and only with certain requirements met–such as actively seeking employment (so, actively encouraging people to work). I realized after your comment that my comment was understandably misinterpreted. So, I want to be clear: I don’t have a problem with the quote Connor used. I have a problem with terrible logic! But in this environment I see that a quick reading of my comment could have been taken as a disagreement with the quote. It was not meant that way. Let me begin by saying I have enjoyed reading your blogs over the last few months, but I think you are confusing the situation by using the largely unpopular, in Church circles anyways, Harry Reid as a smoke screen for some very evil comments made by a President in the Melk. Priesthood running for President of the United States, Mitt Romney. Harry Reid is a minor character to most of the members of the LDS Church. 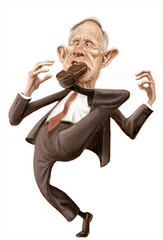 Harry Reid is useful to the right as he creates a negative “knee-jerk” reaction amongst conservative Mormons. In their minds, if Harry Reid said, it is wrong and evil. By focusing on Harry Reid in this piece, you actually divert attention from the fact that Presidential candidate Mitt Romney dismissed nearly half the population of the United States as being unworthy of his attention, something that hurt his campaign bad enough he has since had to recant his former candor. Brother Prince, in his excellent op-ed piece, never mentioned Harry Reid. Harry Reid only agreed with brother Prince. Changing this to a Harry Reid discussion, is making Reid a “straw man” in the discussion of Mitt Romney. Maybe Mitt was right, perhaps half of the US are lazy, fat, poor, and worthless, but what brought them to this situation? Are the poor disposable and evil while the rich are valuable and good as we are told on Fox News? Should the poor be given the boot, told to sink or swim as we now need that money to give tax cuts for the rich and more foreign wars? The orthodox news services never tells us that most of our debt is a direct result of the Military-Industrial complex, unfunded wars, TARP, and the interest on these debts. Social Services are cheap in comparison to these other expenses. They may be expensive and ineffective, but until other problems are fixed, are necessary for those struggling to survive in our modern society. If President Romney really wanted to pay off our national debts, he would have started by advocating the return of TARP money. The return of TARP money would be a great step towards national fiscal security. You can not pay off our debts on the backs of the poor and the lower middle classes. By definition, the poor lack money. The question still remains, what will we do with the poor in this nation that President Romney does not care about? There is a modern term for the poor as “useless eaters,” is it time we limit our surplus population as some college professors have already advocated? Mitt has been a leader in the Church’s welfare program, why hasn’t he advocated instituting the Church’s welfare program on a national level if it worked as well as it is touted? Could it be that this program really does not work and is only window dressing? I have never seen any study conducted wherein a correlation was found showing that the Church’s welfare program moved folks up the economic ladder, teaching them to be “self sufficient” as is the claim. All I have ever heard is antidotal testimonies from various Church leaders and the occasional high council talk every few months. If the program is as successful as advocated, there should be evidence. I liked this piece. Connor is smart. So Harry Reid is the self appointed sheep/goat sorter. Comforting thought that. Cough up your tax returns, Harry. Not that we doubt your bona fides.